Perform a Witches Festival summoning ritual. I have summoned one of the fabled witchmothers, who are rumored to appear only during the Witches Festival! Legends say these strange beings can be bargained with for power. Gather a pumpkin and guts. Kill a delve boss outside Cyrodiil to obtain an Essence of Death. Find Olyve's Brewery and deliver the ingredients. Talk to Olyve again to claim your reward. You will first need to acquire the free Crow Caller whistle from the Crown Store. The whistle can be found in your inventory in the Miscellaneous section (on PC) or the Supplies section (on console); activate it to begin this quest: "<Upon close examination, a faint yellow light emerges from within. Elaborate sigils seem to be carved along the insides of the crow caller.>"
Using the whistle will cause Witchmother Olyve to appear in a cloud of crows. She will request that you obtain a pumpkin, a sample of guts, and an "Essence of Death". To obtain the Essence, you must kill the boss of any delve outside of Cyrodiil. Once you have all three ingredients, you will be directed to Olyve's Brewery in Auridon, Glenumbra, or Stonefalls. Note that as of the 2017 event, you may use any of these three locations, regardless of your alliance, though the quest will still direct you to your alliance's zone. Deliver the items and Olyve will concoct her brew. Finish the quest to receive your reward, which includes the Witchmother's Whistle memento. Using this whistle will summon the Witchmother's Brew. 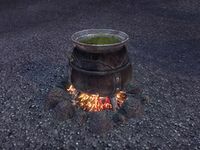 Although this concludes the quest, you will need to summon and drink from the Witchmother's Brew to begin the event. As well as transforming you into a skeleton and granting you a 100% boost to experience gained for two hours, the Brew will allow you to obtain Plunder Skulls from all manner of bosses, including Delves, Dolmens, Group Delves, Public Dungeons, Group Dungeons, Trials, Group Bosses, Dark Fissures, and Celestial Rifts, but excluding most quest bosses. Note that while you cannot drink the Witchmother's Brew in Cyrodiil, you can drink it just before travelling there and still receive the benefits (including Plunder Skulls from bosses) for the duration. The effect can be reapplied using the memento for the duration of the Witches Festival. For respawning bosses, it should be noted that the skull drops follow a separate timer, so forcing the boss to spawn repeatedly will not result in any extra gain. The Witches Festival event is available annually during the Halloween season. During the 2016 season, it was necessary to drink from the Witchmother's Brew in order to get both the Experience bonus and to acquire Plunder Skulls, but as of 2017 this is no longer necessary. Plunder Skulls will drop from bosses no matter what, and simply using the Witchmother's Whistle during the event will give you the experience buff. It is not actually necessary to drink from the cauldron and be morphed into a skeleton. If you want to remove the skeleton morph, you can open the Character menu and right click on the Witchmother's Brew effect to remove it. You can obtain as many free Crow Callers as you like from the Crown Store, but can only hold one in your inventory. After the event ends, it is no longer possible to obtain Plunder Skulls, and while you can still use the Witchmother's Whistle to summon a swarm of crows and a cauldron of Witchmother's Brew, the Experience bonus is not applied, and drinking the brew does not turn you into a skeleton. You may find that you are unable to activate the Crow Caller from your inventory; attempting to do so yields no result, thus preventing Witchmother Olyve from appearing, hindering advancement of the quest. 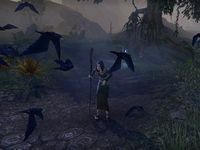 Destroying the Crow Caller and purchasing a new one from the Crown Store will not resolve the issue - a solution, however, is to log out of the game, log back in, and activate the Crow Caller once again. ? The witchmother I summoned doesn't seem hostile. I should speak with her and see what she wants. Witchmother Olyve wants me to bring her some reagents. 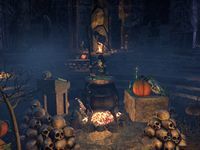 The pumpkin and guts should be easy to find, but I must also collect the "Essence of Death" from the strongest creature in any "dangerous delve" outside of Cyrodiil. I collected the reagents she requested. I should speak with Witchmother Olyve about her witchmother's brew. Finishes quest I delivered the reagents Witchmother Olyve requested. I should speak with her.